Head of Creative and Bid services at Paragon Studios, Andrew Lavery, tells us what it takes to create a winning bid. There are many things that need to come together to create a winning bid, especially when you’re competing for a high-value construction project. You can put forward the best proposal, at a competitive price, but if you don’t articulate in a way that convinces the client you’re going to deliver on the tender, you can find yourself disappointed. 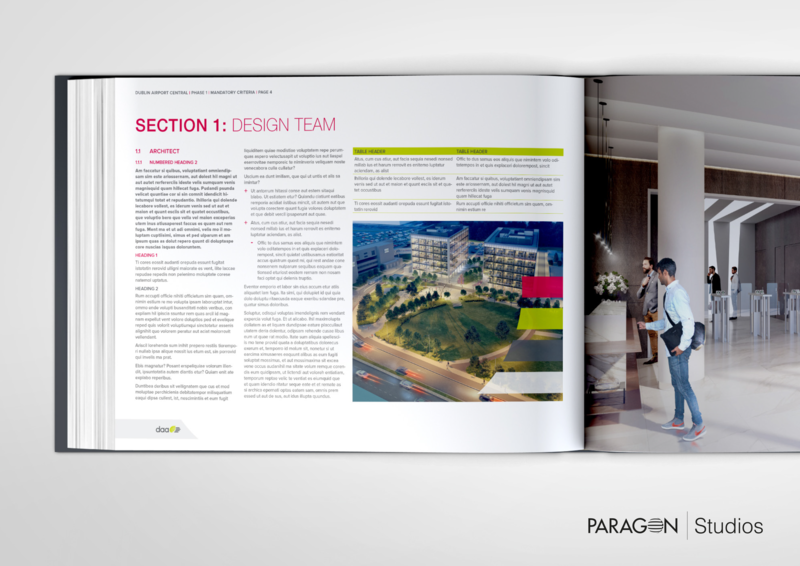 Paragon Studios works with developers, architects and contractors to ensure that their vision is communicated as effectively as it can be. We become an integral part of our client’s creative team, designing technical assets that give them a competitive edge over other tenders. As you can see from the previous projects we’ve worked on, we are passionate about delivering innovative solutions in architectural visualisation, CGI and graphic design to our clients. Sure, we can design things like logos, brochures, proposal documents and so on – to ensure a successful and professional bid submission – but when we have the opportunity, we try to bring our clients’ conceptual ideas to life. We can see things through the eyes of the project’s stakeholders, as well as our clients. We believe that instead of just describing the vision, it’s much more effective to show stakeholders what you have in mind. Architectural visualisation. We use our architects’ sketches and combine them with the input from developers and contractors, to produce photorealistic visuals that communicate the design, in a true-to-life setting. Animation. A step on from architectural visualisation, we create compelling animations so that our clients’ audiences can experience their projects through a guided path. The style of animation depends on your preferences, be it dreamy, photorealistic, cinematic or technical. Construction sequencing. Our technical expertise of the built environment means we can visualise how the construction of a project will play out, including any potential logistical issues or unforeseen inefficiencies that may not have been considered by the project’s stakeholders. Photomontages. What will a construction look like in situ? Our photomontages, which comprise layering computer generated images (CGIs) with architectural photography, answer that question. Visually verified views. A crucial part of any planning application, our images comply with the necessary guidelines. High-quality architectural photography is used to capture the view in two-point perspective, allowing stakeholders to see what the construction will look like in its proposed setting. Realtime walkthroughs. Realtime Walkthroughs enable stakeholders to navigate through the project, inside and out, giving them the feeling that they are there. We give clients the ability to interact with the space, enabling them to make live changes that speed up the design process and help them appreciate the sense of space. This is a great way to communicate a project and understand clients immediate thoughts, making it ideal for client engagements. Virtual reality. We’ve saved the best until last! Virtual reality has come a long way in the last few years, which is great news for developers. We can now transport stakeholders to the heart of a scheme, without them having to leave their seats. The immersiveness of the technology is what sets it apart from other imagery. We’ve found it to be very successful in allowing stakeholders to envision what it will be like to function in the construction. My best piece of advice for visualising a concept would be: don’t just focus on the building; show people how they would function in and around it. If you can do that, they’re more likely to buy into your bid.